Hi, my name is Natasha and I am Sabine’s daughter (joy!) Well, today she decided that she’d rather I finally pulled some weight and wrote an actual blog post (instead of, you know, hanging over her shoulder and making snarky comments) while she fiddled around with rulers and pens which I am incidentally not allowed to touch. Therefore, here I am, slightly at a loss over what to write. I’m kidding. To say that I am ever at a loss for words would be a lie. 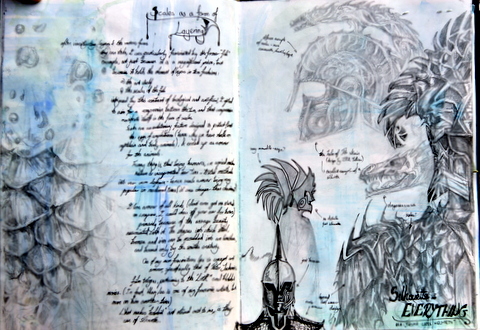 Therefore, I decided to write about my school sketchbook. The rundown of the situation is that for GCSE Art (one of the many courses I am currently taking) you have to put together a sketchbook as an essential part of your coursework. Actually, it is your coursework. You get graded on it. It has to look pretty. Or at least, it has to look like you tried to make it pretty (the latter’ll probably be enough to guarantee you at least an A in GCSE, if not an A*). 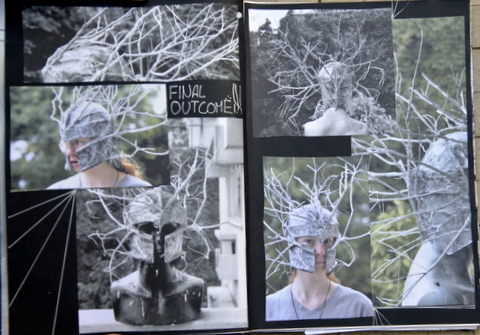 The book’s purpose is to supply the examiner with an indication of your process – how your brain works, from brainstorm and mood-board to final product. (In fact, from what I can tell, the idea isn’t all that different from what my mother does for her design journal, other than that I work with pen and paper while she works on hers digitally). My mind works… weirdly. So you could say that my general approach to the thing is to hang around for a couple of weeks after we got our topic, make a title page according to how my aesthetic feels at the time (I’ve sort of developed a minimalistic style for my title pages? 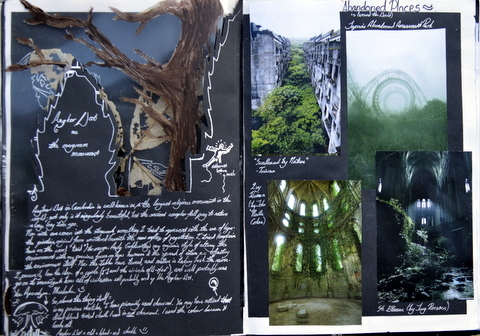 See pictures, I guess :), and spend my art lessons on Pinterest and Google, trying to find inspiration. Then, all of a sudden, I’ll have this one lesson in which I make a brainstorm and plunge myself wholeheartedly into deriving any and all abstract context from my topic. Take the most recent one: in light of our upcoming examinations (it’ll be a year yet, but our teachers want us to start on our actual honest-to-God GCSE coursework now) we were given new topics. Proverbs. Lots of them. We got to pick them out of a hat, and I got (lucky me) “The Pen Is Mightier Than The Sword”. Somehow, within the space of a lesson, I got from there to Cyber-Warfare. “The Pen Is Mightier Than The Sword” – OK then, we have this proverb. Any proverb can be taken two ways: literally, and metaphorically. I looked into the literal meaning first, as it seemed like the easier of the two. How could a pen feasibly defeat a sword? Answer: it can’t. The sword would either smash the pen, or slice it in half (point is, whoever’s wielding the pen is probably dead.) Are there examples in warfare in which a pen has defeated the use of weapons? Well no, not in that fashion. However it is almost never the pen itself which is important, rather, we should focus on what people can do with a pen: relay information. Information – Throughout history we have always known of the importance of information. Information (or the lack of it) can win or lose you a war. As an assassin, you could miss your target due to outdated information; as a trader you might lose your fortune due to a lack of information. Information is everything. Especially now that, thanks to the internet, we have access to more information than ever before. So know that we know all this, how do we connect information (pen) to warfare (sword)? That’s a relatively simple jump. Modern warfare is fought as much through the internet as on the ground, or by drones (actually, scratch that. Drones are an excellent example of using the internet/technology in warfare, but not quite what I was getting at.) You can blow up a nuclear plant given that you have the right codes in the right place at the right time. You can disable an entire nation. Now, after I finish writing up a brainstorm (hahaha more like scrawling it over a sheet of innocent paper) I pick a topic and move on from there. Say I chose Cyber-Warfare. I’ve already finished thinking up the process, what I have to do now is represent it in some sort of understandable way to the examiner. I can’t write them an email or an essay describing exactly how my process works, nor will I get a good grade on my sketchbook if I simply write what I thought, unabridged. Yep there’s my contribution. Again, I hope it made sense.